Ayios Haralambos Church is a 19th Century Greek Orthodox Church located in Cesme. Due to war and population exchange between Greece and Turkey, the Church was decommissioned. 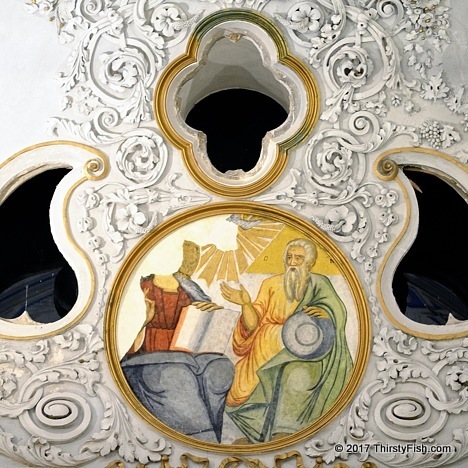 Parts of this ceiling mural have been defaced because in Islam any depiction of God is barred. Earlier today I was having a conversation with someone about plagiarism and specifically self-plagiarism. She told me, under most instances, recycling your own blog posts in your other works without proper attribution is generally considered self-plagiarism. This whole "correctness" business is getting out of hand. Soon, if I want to say "Do not steal!" (Almighty 8) I'm going to be required to cite "God" in the MLA style. Almighty, God. The Ten Commandments. Mount Sinai: Stone Tablets Press, c. 1300 B.C.